Flipped Classroom, Blended Learning, techy tools … These have been in our lives for a few years. Everyday we come across with a new tool, a new site a new idea that we can use in our classes. I just discovered the following tools and I’m planning to give them a try in the New Year. 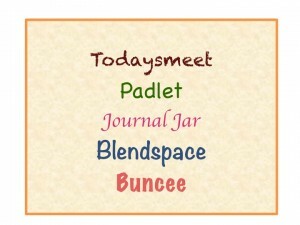 #1 Buncee is another web-based content creation tool. You can add in photos, videos, audio, text, drawings and more. You can ask your students to create their projects on Buncee or you can create your lessons online. #2 Todaysmeet is another tool that I’ll try in 2014. TodaysMeet gives you a room where you can connect with your audience. Your audience doesn’t have to register or know anything about technology. You can create a room and decide how long it will be open for. You can ask a question and ask your students answer it before you start a lesson, it can be used to brainstorm or after reading a book, story or watching a movie, you can ask your students to give their opinion or discuss certain questions or even play trivia pursuit in class if you have iPads or a computer lab in the school. #3 Edcanvas is now Blendspace and is another web-based content creation tool. You can add content from the web or your desktop directly so you can add a powerpoint or a pdf file easily to your canvas. Once finished, you can share it, embed it or print it. #4 Journal Jar is a site that I’m planning to use as a warm-up tool or it may even come handy when I finish early. On the site, you’ll see a jar. When you click “shake”, you’ll be given a writing topic. You can set time limits and ask your students to write short paragraphs until you shake the jar for the next question or tell them they will speak for a minute on the given topic. #5 Padlet, AKA wallwisher, an old friend with new features, an online noticeboard where you can add your ideas on little sticky notes and then print out the document or save it as a pdf file on your computer. Hi Eva! These are great tools to use with students. I’ve used all of them except Journal Jar but it sounds very interesting, I’ll take a look. 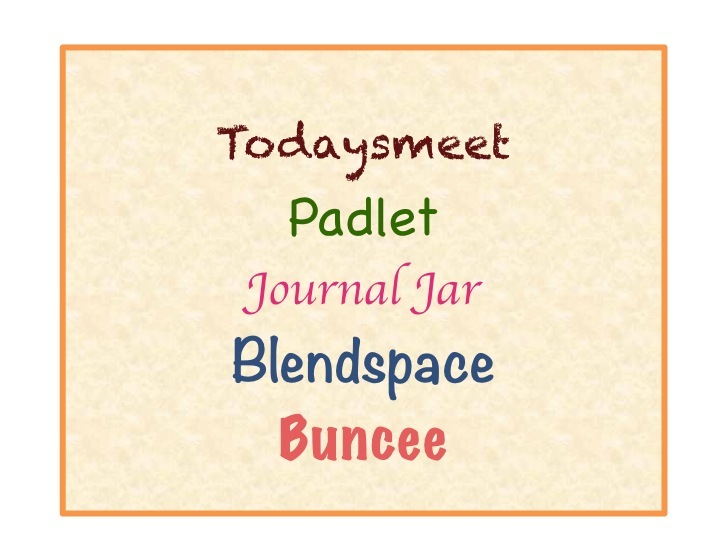 Buncee is cool and Padlet is a “good old friend” so you’ve chosen awesome assistants to help in your teaching next year. I’ve used all except journal jar which I didn’t know. Ihave actuall done some ‘silent’ debates, in class, with todaysmeet. The kids liked it because as it is projected on the board they see each others’ comments and start chatting. I will try journal jar. Seems cool! Hi my name is Jasmine Boykin, I am an EDM310 student at the University of South Alabama. I have heard of blended learning and flipped classrooms but I have never heard of any of these learning tools you have mentioned. They seem very interesting and helpful. Thank you for sharing, I look forward to becoming a teacher and implementing these tools in my classroom!